One of the biggest advantages of having a storage shed is that that you can use the space to declutter the rest of your home. Seasonal items that would normally take up space in your closets, laundry room, or guest bedroom can be moved to your storage shed for easy access when needed later. A storage shed can free up enough space in your home to allow you to find new uses for rooms that were full or cluttered before. That guest bedroom could be now both a guest bedroom and a crafts room with all of the extra stuff removed. The laundry room could now serve it’s purpose better by having more space for organization. A storage shed can also aid in cleaning out the garage. Imagine having a garage that you could use to protect your car from the elements. Some larger and bulkier items such as winter tires, bicycles and lawnmowers can be moved into a shed making the garage more organized, pleasing to the eye and easier to navigate. Storage Sheds are also an excellent place to store sporting gear, hockey equipment, skates, skies, kayaks, roof racks, life jackets, inflatable pools toys, and kids outdoor toys. A storage shed can also replace lost space, when a family member comes home from university or an elderly family member moves in. They are also a necessity when a family adds a rental suite to their home, as they provide some of the space that is lost to the tenants. The biggest advantage of a storage shed is that it helps keep your life and your possessions organized, so you can find them easily and quickly, when needed. There are many different types of shelving and racking available today, when combined with bins or totes allow for effective organization. The diagrams at the right show two possible configurations for an 8 x 12 storage shed. 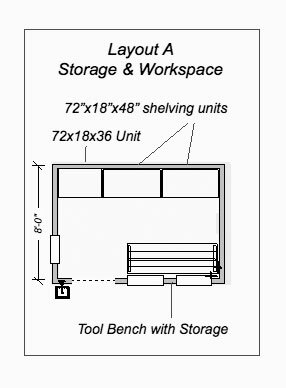 The first diagram includes one wall of storage and a work bench on the opposite wall. 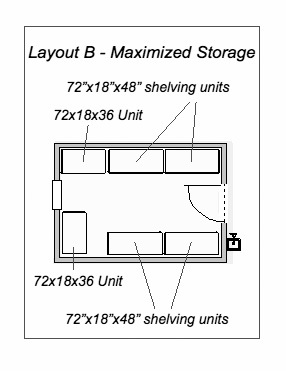 While the second diagram has no work bench, but is maximized to get the maximum storage out of the shed by using three of the walls for storage units. For more questions or options on building a new storage shed or how to get the most storage out of a new storage shed, please give us a call at 604-277-5572.